The official results and complete list of passers of March 2018 Civil Service Exam (CSE) Professional and Subprofessional Levels for NCR, Region 4, Region 1, Region 12, CAR, CARAGA, ARMM, among other regions are released by the Civil Service Commission (CSC) on May 16, 2018 or 59 days after the exams. A total of 25,633 examinees passed the Professional Level while 4,573 passed the Subprofessional Level. The eligibility exams were held on March 18, 2018 at designated regional testing centers nationwide. Complete list of passers arranged according to Regional Testing centers as well as the full results and CSC important reminders both for Professional and Subprofessional levels are itemized at below summary. Below is the table showing the number of March 2018 CSE passers per Regional testing centers, courtesy of CSC. Civil Service Exam are scheduled twice a year for growing number of aspiring eligibles. The next CSE will be on August 2018. 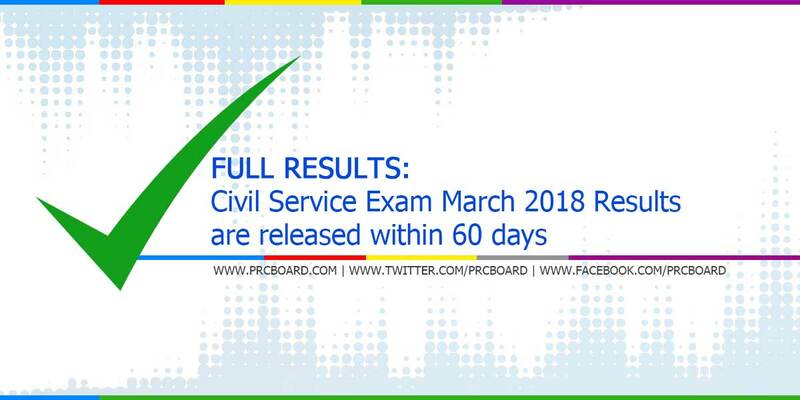 To receive real-time updates on Civil Service Exam/ CSE Results March 2018 or any updates on board examinations conducted by Philippine-based agencies such as PRC, NAPOLCOM, SC, among others, we advised to visit their respective official websites or follow us at our social media accounts via Facebook and Twitter. how many takers for both eligibility? Where can I found the listing results of all examiners and rating whether passed or not? List of passers are available online just search it while the rating will be available starting June 1.
i passed the sub pro civil exam will i get any certificate to show i passed it? makukuha na po ba un agad once passed? or days after? Eto na ba yung result nung mga take ng exam nung marh 18? ?